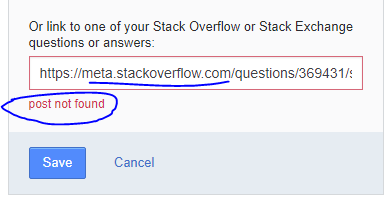 I want to show off my upvoted questions and answers of Meta Stack Overflow in my developer story. Several of my questions and answers on Meta had received a great response. I strongly think that my meta post can convey my analysis and innovation skills. But I just can't add the meta SO link in my developer story. Please provide ability to link the top posts of meta sites as well. In the answer of @abccd, @abccd linked 'Introducing the developer story' meta post, that first announced developer story (and received many downvotes) and I asked this feature request based on 'The Developer Story Part 2: We didn't explain that very well' meta post that actually clarified the announcement and redefined the scope of developer story better. Why allowing to link meta post to developer story is a good idea? It's called "Developer Story" but I'm not a developer; can I still use it? Even if your title isn't developer, we have jobs posted for developers, sysadmins and project managers; this feature is available to everyone on Stack Overflow regardless of job title. Sure, as @abccd says, Meta sites are indeed for discussions regarding Stack Exchange sites and the software that powers the sites. However, Meta Stack Overflow is little different. It is this site where site's major changes are announced, experimented, taken feedback on, A/B tested, put on live and bugs reported. From clever design bug reports, new feature requests, to major announcements like Documentation, Teams, developer story, Question template wizard etc.- most of them comes in here first, and intensely discussed, fought, trolled and signed off. 678 questions are tagged with [bug] with [status completed] and upvotes greater than 10. 137 questions are tagged with [design] and [bugs] with [status completed] and upvotes greater than 10. 211 questions are tagged with [Feature Request] with [status completed] and upvotes greater than 10. Therefore, any of the well-received design or functional bug report, feature-request, feedback or answer on Meta SO are also good enough to convey "every aspect of developer job-seeker's identity" where job seeker can be designer, db admin, project manager, system analyst, full stack developer etc. Therefore, IMO, it's a good idea to have MSO posts linked in developer story. IMO, it wouldn't make much sense to allow meta links in your developer story as one of your "Top Post". [Developer story is] the way we envision you showcasing every aspect of your developer identity. Meta sites are for discussions regarding Stack Exchange sites and the softwares that powers the sites; therefore, questions and answers posted in meta carry little to no meaning regarding you as a developer nor they relate to any "aspect of your developer identity". For that reason, I'm against this feature-request. Not the answer you're looking for? Browse other questions tagged discussion feature-request developer-story . What happens “behind the scenes” when a post is tagged with [feature-request]?